The latest value of TSI is 1360.8 W/m^2 (ref. Kopp & Lean 2011) measured by SORCE TIM. This is considerably lower than the ~1367 W/m^2 based on previous data that is used in most GCM models, including GISS model II. This lower TSI value has also recently been accepted by the ACRIM and PREMOS teams based on new ground calibrations of their instruments. What effect does this lower value of TSI (total incident solar radiation at 1AU) have on GSM climate sensitivity predictions? To investigate this I made an identical run of GISS GCM model II for an instantaneous doubling of CO2 in 1958 (as described in the previous post), but changed the TSI value to the now accepted lower value. I stopped the run at 2020 to save time, since nothing much happens afterwards. The comparison between the 2 results is shown below. Comparison of climate sensitivity to a doubling of CO2 for the old value of TSI (1366.6 watts/m2) and the new value (1360.8 watss/m2) in red. 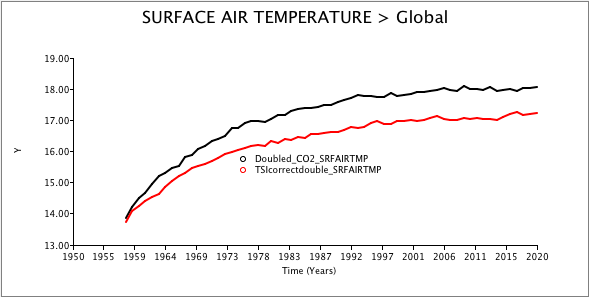 The climate sensitivity to a doubling of CO2 is now reduced from 4.4 deg C. to ~ 3.5 deg C. , which is about a 20% reduction. I am pretty sure that this also means that all IPCC models are likewise overestimating climate response to CO2 increases by about 20% if they continue to use the older value of TSI rather than the new more accurate measurements from SORCE TIM group. This entry was posted in AGW, Climate Change, climate science, GCM, Science and tagged Climate Sensitivity, CO2, GCM, TSI. Bookmark the permalink.